The fumes and gases that result from the welding process can cause acute or chronic health effects if proper precautions are ignored. The fume plume contains solid particles from the consumables (electrodes), base metal, base metal coating and gases formed in the process, which include oxides of nitrogen and ozone.. The gases used for shielding (argon, helium, and carbon dioxide) are non-toxic, but as they are released, they displace oxygen in breathing air. This can cause dizziness, unconsciousness, and even death with longer exposures. Avoid exposure to fumes and gases whenever possible, and use ventilation equipment or a respirator when necessary. 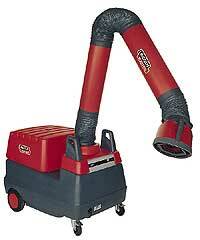 Use enough ventilation or exhaust to remove fumes and gases from the work area. Mechanical equipment should exhaust at least 2000 cfm of air for each welder, except where individual exhaust hoods, booths, or air-line respirators are used. Natural ventilation may be used under certain conditions. For welding or cutting mild steel, natural ventilation is usually sufficient if a room has at least 10,000 cubic feet per welder, with a ceiling height of at least 16 feet. Cross-ventilation should not be blocked, and welding should not be done in a confined space. Don’t get too close to the arc (« Avoid the plume »). Use corrective lenses to help you maintain the proper distance if necessary. Read and understand the Material Safety Data Sheets (MSDS) for the product.Read and obey warning labels on all containers of welding materials. 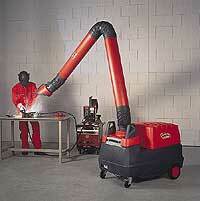 Use a smoke extractor-type welding gun for semiautomatic welding processes. Protect your eyes and face with a properly fitted welding helmet that is equipped with the correct grade of filter plate (See ANSI Z49.1 and Z87.1 standards). Fig. 1 shows suggested shade numbers for various arc welding processes. Infrared radiation can cause retinal burning and cataracts. Even brief exposure to ultraviolet (UV) radiation can cause an eye burn known as « welder’s flash, » which results in extreme discomfort, swelling, fluid excretion, and possibly temporary blindness. Protect your body from welding spatter and arc flash with clothing made from durable, flame-resistant material, such as woolen fabrics, and gear that includes flame-proof apron and gloves, leather leggings, and high boots. Avoid clothing made of synthetic materials, which can melt when exposed to extreme heat or sparks, or cotton unless it is specially treated for fire protection. Keep your clothes free of grease and oil, which may ignite. 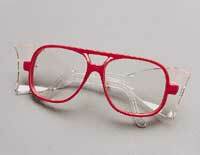 Protect others from spatter, flash, and glare with non-flammable protective screens or curtains. 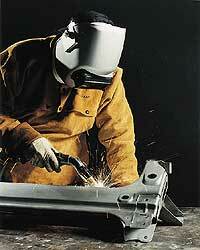 Be sure to wear safety glasses with side shields when in a welding area. 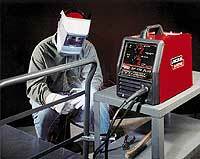 The hazards of electric shock are one of the most serious risks facing a welder. Contact with equipment or metal parts that are electrically « hot’ can cause injury or death from the shock or from a fall that results from reaction to the shock. Primary voltage shock (i.e., 230, 460 volts) is the most serious danger because it is much greater than secondary voltage shock (i.e, 60 – 100 volts). Primary voltage shock comes from touching a lead inside the welding power source while you have your body or hand in contact with the welder case or other grounded metal. Turning the equipment’s power switch « off » does not turn power off inside the case. Never remove panels without unplugging the input power cord or turning the power disconnect switch off. Secondary voltage shock comes from touching part of the welding circuit, such as a bare spot on the electrode cable, while also touching the grounded metal workpiece. Avoid touching both parts of a circuit at the same time. Be sure you are insulated from the workpiece and ground, as well as other live electrical parts. Don’t lean on the workpiece. Use plywood, rubber mats or other dry insulation to stand on, and wear dry, hole-free gloves. Stay dry, and do not weld when you are wet. Never dip the electrode in water to cool it. Check equipment to be sure it is properly grounded, in good repair, and installed according to prevailing codes. Be sure equipment is turned off when not in use. Electric current flowing through a conductor causes Electric and Magnetic Fields (EMF), which can interfere with pacemakers and may effect health in other ways. Consult your physician before arc welding if you have a pacemaker. To avoid excessive exposure to EMF, keep the electrode and work cables together, never place your body between the two cables or coil the electrode lead around your body, and do not work directly next to the welding power source. Welding sparks can cause fire or explosion and can easily go through small cracks and openings or spray up to 35 feet to adjacent areas. 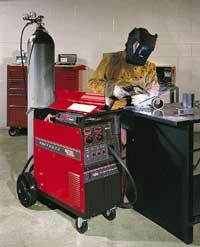 Remove fire hazards from the welding area or cover them with a fire-resistant shield if necessary. Do not weld near unshielded fuel or hydraulic lines. Cylinders used for shielding gas in some processes can explode if handled improperly. Always store and handle them safely, keep them upright, and protect them from mechanical shocks or falling. Maintain all hoses, fittings and regulators in good condition. Never allow the electrode or any electrically « hot » parts of the welding equipment to touch a cylinder. Do not weld near fumes from other processes, such as cleaning, degreasing or painting. Some fumes may cause an explosion, and others can form highly toxic gases when exposed to welding arcs and heat. Ear plugs or muffs will help prevent hearing loss from working around noisy arc welding equipment or some processes. They also will keep flying sparks out of your ears, especially when welding overhead or in close quarters. Hearing loss can be gradual and will add up over time, so ear protection is always a good idea. Welding is indispensable to numerous industrial and consumer products, as it plays a key role in building and maintaining the equipment, tools and infrastructure that make our abundant lifestyle possible. Done properly, it is safe, productive and efficient. Poor safety techniques often translate into poor quality as well as posing a hazard to operators and other people in the area. Insistence on strict safety requirements for welding operations will pay off in employee health and productivity. (1) As a rule of thumb, start with a shade that is too dark to see the weld zone. Then go to a lighter shade which gives sufficient view of the weld zone without going below the minimum. In oxyfeul gas welding or cutting where the torch produces a high yellow light, it is desirable to use a filter lens that absorbs the yellow or sodium line in the visible light of the (spectrum) operation.